“Bad dads” have been getting a bad rap, says Braaver, who offers results of a federally funded study showing that some divorced fathers really do care about their children. In 1985, Braver (Psychology/Arizona State Univ.) began following more than 1,000 families in Maricopa County, Ariz. (which includes Phoenix), who had filed for divorce but whose marriages were not yet dissolved. His purpose was to put some meat on the bones of the numbers that pointed to divorced dads as abandoning their children financially and emotionally, and to find out why this was happening, if it was. He and his colleagues discovered the numbers were wrong. The Census Bureau figures that had fueled tough new laws (and expensive bureaucracies) to enforce child support were based on interviews only with custodial parents (usually mothers). Then, too, census researchers combined statistics concerning families of divorce with those of never-married single parents to create what Braver calls the myth of deadbeat dads. The author’s research demonstrates that the divorced father’s unemployment is the most important factor in nonpayment of child support. Myths under attack: the “disappearing dad,” who initiates the divorce and then deserts his children; and the widely cited 73 percent drop in standard of living that divorced mothers and children suffer (an alleged error in arithmetic by Harvard researcher Lenore Weitzman). Braver’s calculations indicate that post-divorce mothers and fathers share about the same standard of living, at least in the beginning. Although he’s not above citing outmoded figures and attitudes himself, Braver does demonstrate that much of the negative view of divorced fathers is dated. The book concludes with suggestions for reform of custody policies and for programs, including extensive counseling and mediation, to either prevent divorce or help both parents minimize its impact on their children. 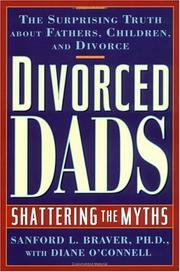 Male martyrdom may be overstated here, but new material suggests that everyone, including fathers, suffers in divorce.